Happy Lunar New Year and President’s Day weekend! After feasting with friends over New Years (Mom is visiting later with a cooler full of homemade cooking), Nick and I decided to head south for a few days to escape the cold. 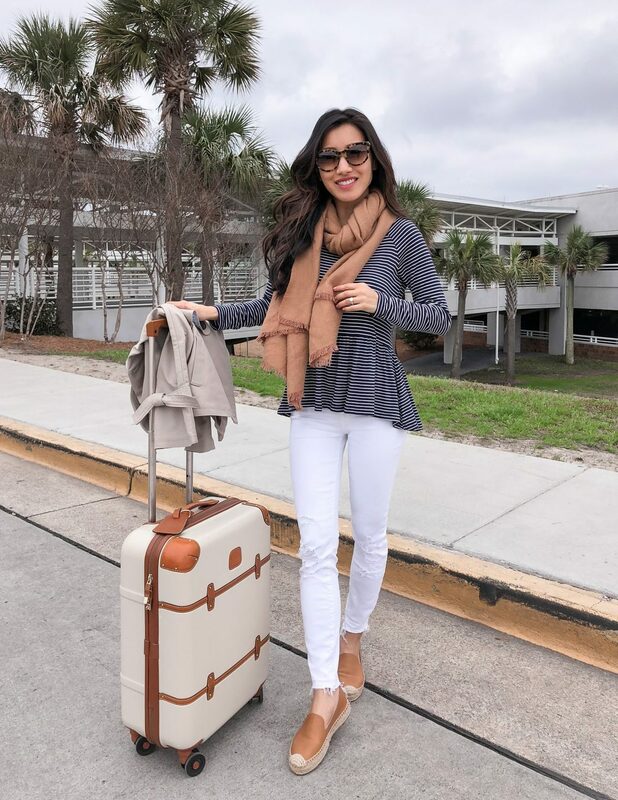 I’m wearing this comfy outfit on the plane as I type – this affordable striped tee is soft and stretchy, and the loose-fitting peplum is very forgiving for growing waistlines. My white jeans are pricier (use code FORYOU15 for 15% off) but I’ve sure gotten my money’s worth over the years. I’ve worn them countless times including here, here, here and here just to name a few! Scalloped T-Shirt – have this in xxs and it’s a great staple. Length is long enough to accommodate a growing bump. Since I’m pale as a ghost these days, I liked the black color best for highlighting the scalloped neckline. Scalloped Cami Top – have and adore this in cream & black. See it on me here, here and here in sz 00. Bow-Neck Sweater – so simple but so cute! Wear half-tucked with ankle pants or with skirt for work. Would be even better if the bow were removable. Striped tie-waist shirt – a lightweight, casual-fit button-up shirt that can be worn for work, or casually tied over jeans or a dress. For a more professional workwear option, I’d recommend this striped button-up which is in a “dress shirt” material and fits more slim throughout (xxs petite is a perfect fit). Edie leather loafers – my friend highly recommends these as a comfortable flat! She said true to size if you have normal to wide feet, or go half a size down if you have narrow feet. Sweater blazer – so bummed this doesn’t come in petites! I’m recommending this for taller ladies because the nice, thicker knit material feels so comfy and the price is amazing for the quality. On someone my height (5 feet tall), however, the torso and sleeve length are several inches too long and not alter-able. Affordable petite jeans (!) – these are a newer size option available only at H&M online. I’ve only tried on this style and they fit nice and slim, with length ending right below my ankles. Sz 2 would have been perfect on me pre-pregnancy – that size fits the same as my Topshop Jamie jeans in sz 25 waist, and like my other denim in sz 24. I sized up to 4 for some extra room at the waist. Fitted blazer – comes in 4 colors! Several of you asked for more affordable blazer suggestions. H&M is usually my go-to, but FYI petite ladies will need to either fold the sleeves under or get it shortened to fit, and you usually get what you pay for in the fabric quality. I’ll show fit photos of this one soon! It fits narrow, typical of H&M (I take sz 2 in their blazers, which fit like 00) and the sleeves will need hemming, but the torso isn’t too long. The deal: 40% off full-priced items, extra 60% off sale items with code HAPPY. Ends 2/19. Floral shell (also avail. in maternity!) – As shared in a recent email newsletter, the below fitting room pic is courtesy of my same-sized cousin! 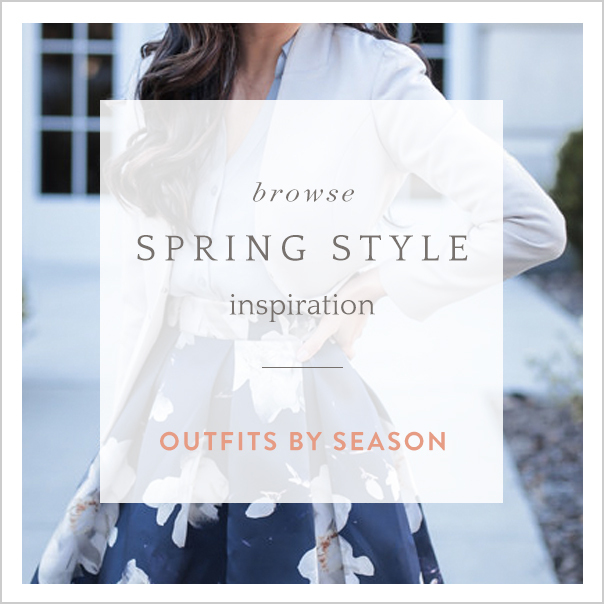 A floral top in a pretty color scheme is one of the most versatile pieces in my closet. Some of you might remember this old floral blouse which I wore on repeat here, here, here, and in this video. This updated version is even cuter in a lightly textured fabric. I’ve worn it twice already and will be posting several work looks with it, so don’t miss out while it’s fully in stock! The yellow trousers below scream spring and made of a nice, thicker material. However, they run big, typical of LOFT pant sizing. My cousin said they were pretty roomy in size 00 petite (on the other hand, LOFT’s modern skinny jeans usually fit us okay in 24 petite). Maternity petite pants – LOFT is one of very very few brands out there to make this niche sizing category! I don’t need maternity pants just yet, but a lot of these have great reviews and are usually excluded from sales. The deal: Take 15% off full-priced items with code FORYOU15, with free shipping & returns (to several international locations). My picks: The white J.Brand jeans (also avail. in maternity!) and Thierry Lasry sunglasses I’m wearing above are splurges, but have proven to be longtime wardrobe favorites. Also just ordered a replacement pair of Nippies adhesive covers after wearing my latest pair countless times (I get the “light” shade) – I’ve gotten so many friends hooked on these! The deal: 40% off (no code needed) + free 3-5 day shipping on orders of $75+ (with code BRSHIP). Ends 2/20. It’s no secret I love BR Sloan pants, but their fit runs all over the place with various colors and fabrics fitting differently. I recently tried on this olive pair (“flight jacket”) in 00 petite, and it fit much better and slimmer than other Sloans I’ve tried on in the past year! Just ordered this striped ruffle top + this check tweed shell for layering over button-up shirts. The deal: 40% off (no code needed), ends 2/19. The deal: 40% off full-priced items and extra 50% off sale items with code GETMORE. Mother of pearl station necklace – I ordered this the moment it came out and it just arrived. It’s a pretty piece that’s slightly inspired by the gorgeous, understated Van Cleef & Arpels alhambra necklace. Since the original runs about $15k and is not in my future anytime soon, this AT one will do! Love the yellow pants, really cute! I love your pictures!!! You are so inspiring!!! such good sales, thanks for the roundup. I’m loving the travel outfit Jean! It looks so stylish! Hi Jean!! So excited for you and your husband!! Your announcement regarding your pregnancy made me so very happy!! As you know I’ve been following you for a few years and love everything you wear!! I have a question regarding Express. The xxs sell out so quickly online. It says only a few select stores carry this size. Do you know any stores that carry things in xxs? I love the cardigan you recommend in the alabaster color. It sold out online so so fast! Have a safe flight! Hi Laurie! Aww thank you, you are so sweet! Unfortunately I’ve never seen xxs in Express stores and I always keep an eye out for it. It’s a bummer they don’t carry a wider range of sizes in-store, including petites. However for slouchier, casual-fit pieces like that dolman cardigan, you might be able to get away with one size up. Jean, Couldn’t find an email to contact you but I have a quick request. Can you review the Frankby versus Ashbury Burberry jackets fits? They aren’t available anywhere physically near me so I am nervous to order online. The Burberry quilted jacket is a timeless classic that I am hoping to make my first investment piece. You are the cutest little traveler! Hi Jean! I’ve been following you for YEARS! Congratulations on your pregnancy!!! I remember you recently posted an instastory on book recommendations…would you consider doing a post on this? Thank you so much, Jessica! Yes I’ve been reading through a lot of reader recommendations, and was thinking about doing a recap of some favorites form that list! So in love with your travel look! Hey Jean! Any tips on business attire? I searched through your blog and found some suits from 2010 and I know you probably don’t wear this too often but for someone that’s looking for an outfit for interviews do you have any advice? Thanks in advance! I would do a navy suit with a feminine blouse underneath! ann Taylor would probably be my go-to recommendation these days for something reasonably-priced and fair quality. THey have navy tropical wool and another lightweight wool stretch material in suiting separates. Thank you so much, I appreciate that!! Always enjoy your great posts ! Happy Year of the Dog . Loving all of these sales <3 🙂 Hope you had an amazing Lunar New Year! Oh. Em. Gee. Of course I am beyond excited that you’re pregnant. Those of us who also struggled with infertility celebrate with you!!! But selfishly… I was also excited because I was going to get some maternity clothes dropped. The Loft? MATERNITY PETITE?! You have no idea of the tents that are out there that people say are matenity dresses. Lucky for me, I never got very big and I would get away with wearing some of my stretchy BR dresses at work. But it was so hard to find maternity clothes that would work for work. Looking forward to seeing other stores that have matenity wear!!! Hi Stacey! Haha I did order some regular maternity (not petite) pieces for fun and was underwhelmed … to say the least. Petite maternity (at least from ASOS petite maternity) did fit notably better, even though I don’t need it just yet! Those are great deals! Thank you for sharing. Love your outfit! Hi Jean, 1000 congrats on your pregnancy! I just had my first baby in August and it’s lots of fun! I sure wish our pregnancies aligned as I could have used tips re: finding maternity clothing for petite women… oh well! I have a new problem I”m hoping you can help with; I was petite before the baby but re: nursing, I’m even tinier now. All of the pants I’ve had tailored are baggy, my jeans are loose, etc. I’m 5’3 and weight just 90 lbs. What are the best places/brands for jeans and dress pants? I usually buy BR and have them altered; sloans are too big, so I need something smaller still. I’ve never tried WHBM, Loft, or JCrew for dress pants but am willing to try anything at this point!! Re: Jeans, Silver Jeans, size 24 inseam 29 were my go to but what used to fit like jeggings now fit like boyfriend jeans… where should I start ? I feel your pain with being so petite (5’0″ 90lbs)! BR dress pants are also much too large for me. The J. Crew Cameron pants Jean has blogged about in a size 000 are my go to work pants. They fit me snug on the waist. They do slightly stretch around the bum area, but have never become baggy for me even after a long day in the office. For jeans, my favorite brand has become Topshop. I like their Jamie style in a size 24 waist. I typically wear a 22/23 in other brands like J Brand (my second favorite), but Topshop runs small. Although I have found that different colors even within the same style fit a little differently, a 24 has worked for me 99% of the time. Hi Christie, congrats on being a new mama! It’s very tough to find bottoms that don’t need alterations for an extra petite stature … Laticia pretty much covered it with the only two brands I can think of (J.Crew size 000 petite but only in that specific Cameron style, and Topshop sz 24 (which runs a whole size smaller than most other denim brands). Hey Jean! Can you review the fits of the Frankby versus Ashbury Burberry jackets? The quilted jacket is a timeless classic I am hoping to invest in soon but don’t have a store nearby where I can try them on. I would really appreciate it. I am similar to your size and worried about waist definition and overall length. Hi there! Unfortunately I don’t have any plans to order those style jackets and I don’t go into my local boutique very often (trying things on there usually result in pressure to buy from the SAs). Burberry has free shipping and returns online though, which I’ve taken advantage of a few times before! Hi Jean, Happy Chinese New Year! Hi Stephaine – I don’t really dress on a capsule collection system, but there are a handful of items that you’ll see appear on repeat throughout my blog posts! ie. white jeans, navy ankle work pants, a striped blazer, a navy blazer, drapey-feeling blouses, and high-waisted ankle jeans. Love this outfit! I’m 7 weeks pregnant :-). Will you be sharing maternity fashion advice as you grow :-)? Congrats! And yes, of course! What handbag do you take on international travel?